A new 12-volt generator was custom made for the car. It turns out that the original 6-volt generator and the more modern Delco-Remy 12-volt generators are the same diameter. Thus reusing the old generator mounting saddle was possible. The only thing that had to be considered was that a 12-volt generator is 2" longer than the original 6-volt generator and thus clearance between the generator and the frame as the car's springs flexed had to be kept in mind (the clearance ended up being about a half inch!). The generator had to be custom assembled from parts of several generators since it would be mounted at the rear axle where water splashing from the rear wheel would be a problem. The end caps had to be solid and not open for cooling like generally found on automotive generators. The combination cooling fan and pulley found on most generators would not be included since this generator would not rely on a pulley for power transmission. 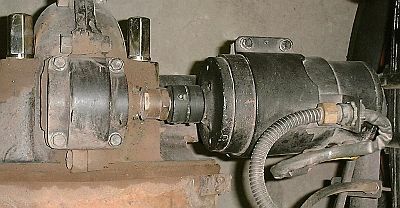 As the generator was coupled to a gear driven from the differential gear the counter-clockwise rotation of the generator armature had to be taken into account when the generator brushes were installed. 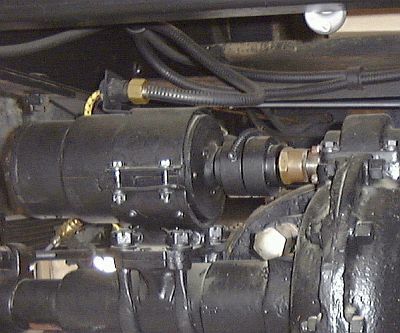 Once the generator had been procured and mounted the coupling of the generator shaft to the differential gear drive shaft could be addressed. Due to shaft sizes and the minimal space available between the generator and differential cases a custom coupling was designed and machined.